How do we meet Australia’s needs? To meet our investment requirements in Australia, we require leadership from our commercial community and political-will on behalf of our government, to provide the necessary infrastructure and the economic settings to allow us to compete. The emergence of private public partnerships (PPP) to make these projects affordable is a complicated option but a possible instrument to fund these project. PPP’s work well when there is some form of toll or user pay system installed for the original investment to be retrieved by investors, but this is not always possible and are not always welcomed by the transport companies. Another development is Asset Recycling which has come into vogue by selling or leasing-off older infrastructure such as the Port of Melbourne and the Electricity transmission assets in Sydney Australia. These activities are raising significant funds for reinvestment into the economy. Australia has engaged with our trading partners in the region with ‘Free Trade’ agreements with most of our Asia Pacific partners in place, with more currently under negotiation. According to OECD, Trade in goods and services journal: China, Japan, United States of America, South Korea and India make up our top five trading partners in the region and Daniel Workman from ‘Australia’s Top trading Partners’ tell us that “46.4%” or almost half of our export sales goes to China and Japan. With the combination of Free trade Agreements and the expansion of Logistics and International Trade in the region; this should add significant bilateral earnings between Australia and our trading partners. As part of our role in international trade, Australia is developing its capacity. Victoria International Container Terminal recently became operational in Melbourne in the formerly used Webb Dock region. With an estimated $200,000.00 million dollar investment at the initial stage (2) and Patrick Stevedoring and DP World of Melbourne, also upgrading and expanding capacity at their respective facilities. Hutchinson Ports-Australia have been investing heavily in their Brisbane and Sydney facilities as well. This puts Australian facilities in a very competitive position with short term pain being experienced because as capacity and competition has increased, the total volumes of trade have not increased substantially, and this has led to reduced revenues being generated. 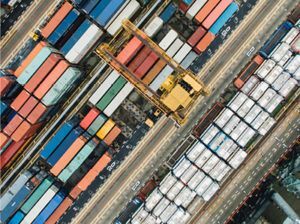 As international freight volumes increase, Australia will be in an ideal position move import and export freight through our ports quickly and efficiently. The economic challenge will involve maintaining a healthy ‘Balance of Trade’ rate so that Australia can produce and export more value than it imports. We need this to encourage our own economic stability but also to attract business and foreign investment to support our economy.